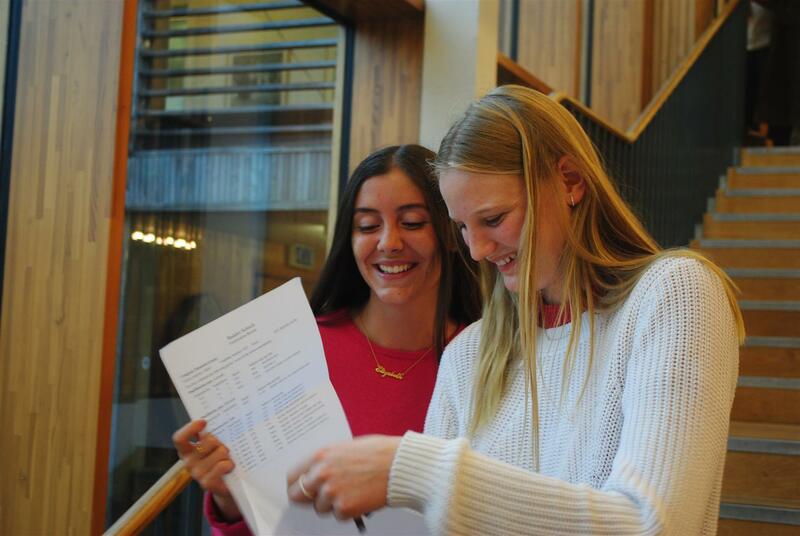 Bedales students have achieved excellent A Level results for 2012 with 39% of all grades at A* – A. They have secured places at universities including Oxford, Exeter, Edinburgh, London, Bristol, the Royal Veterinary College, the Royal Agricultural College, art colleges such as Falmouth and Leeds, and international institutions including Bocconi (Milan), New York University, Davidson (North Carolina) and University of British Columbia. Nine students achieved places at Oxbridge, including Jack Briggs (from Cirencester) who, with an impressive six grades at A* or A, has secured a place at Oxford to read Medicine (A* in Mathematics and five As in Biology, Chemistry, Further Mathematics, Physics and Religious Studies). He will be joined at Oxford by Luke Austen (from Emsworth) who will also study Medicine after achieving three A* grades in Biology, French and Mathematics, and an A in Chemistry. Cicely Robinson (from Petersfield) secured her place at Oxford to study Mathematics after achieving an A* in Mathematics, and three As in Further Mathematics, Chemistry and Physics. Tegen Evans (from London) achieved three A* grades in English Literature, History and Religious Studies securing her place to read English Language and Literature at Oxford. Jamie Russell (from Miland) is to read French at Oxford after achieving two A* grades in French and History, and an A in Geography. Head Girl, Rebecca Wilson (from Liss) achieved three A grades in English Literature, French and Religious Studies to secure her place at Bristol to read Philosophy and French, while Deputy Head Girl, Laura Stewart (from Winchester) will read Philosophy and Theology at Edinburgh after achieving an A* grade in Religious Studies and two As in English Literature and History. During their final year at Bedales both girls jointly received the Cecily Eastwood Award for their contributions to the school. Titus Buckworth, Head Boy (from London) achieved an A* grade in Mathematics, two As in Further Mathematics and Physics and a B in Religious Studies and will read Mathematics and Philosophy at Nottingham, while Deputy Head Boy, Richard Ward, achieved two B grades in Design and English Literature, and a Cambridge Pre-U M3 in Music. Oliver Bradley (from Petersfield) achieved an A* grade in Mathematics, and three As in Biology, Chemistry and Physics, and will read Mechanical Engineering at Imperial College, London. Twin sisters Claudia and Sophia Turner (from London) are also celebrating: Sophia achieved three A grades in English Literature, History and Spanish, and will read History at King’s College, London. Claudia achieved two As in Religious Studies and Spanish, and a B in English Literature, and will read Spanish and Philosophy at Edinburgh. Darren Siah (from Weybridge, Surrey) achieved an A* in Art and two B grades in English Literature and Drama & Theatre Studies. While at Bedales, Darren was awarded the Gabriel Bruce Book Prize for his academic and creative excellence at AS and A2, as well as his contribution to successful school performances at the Edinburgh Fringe last summer and several notable internal productions. This annual prize is awarded to a member of 6.2 (Upper Sixth) who has achieved outstanding work in Theatre, Art, and in particular, general contribution to the school community. An increasing number of Bedales students are choosing to study overseas. Maria Garfunkel (from Argentina) achieved three A grades in French, Italian and Spanish, and a B in Economics, and will read Economics and Finance at Bocconi University, Milan. Maddie Butcher (from Arundel) achieved three B grades in Classical Civilisation, Psychology and History and will attend the University of British Columbia, Vancouver. Cormac McShane (from London) achieved an A in Religious Studies, and two Bs in Classical Civilisation and History, and progresses to Davidson, North Carolina. All will read Liberal Arts degrees. Isabel Fitzgerald from Chichester achieved three A* grades in Biology, Chemistry and Mathematics. Joely Harris from Crockerwell, Devon achieved two A* grades in History and Religious Studies, and an A grade in English Literature; to study English at Exeter. Christy Callaway-Gale from Liphook achieved two A* grades in English Literature and Spanish and a D3 in Cambridge Pre-U Music. Sophia Burnell from Petersfield achieved an A* in Art, an A grade in English Literature and a D3 in Cambridge Pre-U Music; to study a Foundation Diploma in Art & Design at Falmouth. Sarah Praetorius from Germany achieved an A* in German, an A in History and two B grades in English Literature and Drama & Theatre Studies; to study Anthropology at University College London. Lucy Duncan from Petersfield achieved an A* in Design, an A in Mathematics, and a B grade in Economics; to study Mathematics and Business Studies at Edinburgh. Ralph Woollcombe from London achieved an A* grade in Mathematics, an A grade in Art and a B grade in Biology; to study Zoology at Bristol. Florence Sandberg from Petersfield achieved an A* in Religious Studies and two B grades in English Literature and History; to study Law at Bristol. Hugo Fell from London achieved three A grades in Classical Civilisation, Latin and Mathematics. Henry Quekett from Petersfield achieved two A grades in Design and Economics, and two B grades in Physics and Mathematics. Toby Goodger from Petersfield achieved two A grades in Biology and Design, and a B grade in Geography. Olivia Yetman from Petersfield achieved two A grades in Biology and Mathematics, and a B grade in Chemistry; to study Veterinary Medicine at The Royal Veterinary College, London. Claudia White from Petworth achieved three A grades in Physics, Geography and Mathematics; to study Law with Politics at the New College of the Humanities. Henri Hamm from Totternhoe, Bedfordshire achieved two A grades in Economics and French, and a B in Biology; to study Banking Finance and Management at Loughborough. Samuel McNeil from London achieved two A grades in Economics and History, and a B in Geography; to study History at the School of Oriental and African Studies, London. Claudia Miller from Upham achieved two A grades in Art and History, and a B in English Literature. Alexandra Anholt from Scratby, Norfolk achieved an A in Italian and two B grades in Art and French; to study Art History and a language at Sussex. Andrew Richards from Goudhurst, Kent achieved an A in Mathematics and two B grades in Design and Psychology; to study Product Design at Kingston. Mathilda Reekie from Laurencekirk, Scotland achieved an A grade in Art, and two B grades in Classical Civilisation and History; to study Art History at Sussex. Rosie Crawley from Petersfield achieved an A grade in Classical Civilisation and two B grades in Art and Dance; to study a Foundation Diploma in Art & Design at Falmouth. George Eve from London achieved an A grade in Classical Civilisation and two B grades in English Literature and History. Elliott Hills from London achieved an A grade in Classical Civilisation and two B grades in English Literature and Religious Studies; to study American Studies and English at Sussex. George Vaughan-Barratt achieved an A grade in Economics and two B grades in Classical Civilisation and Religious Studies; to study Philosophy and Theology & Religious Studies at Leeds. Fred Aspel from Windsor, Berkshire achieved three B grades in Physics, Psychology and Mathematics; to study Mathematics and Psychology at Newcastle University. Katherine Horlick from London achieved three B grades in Classical Civilisation, History and Religious Studies. Harriet Ivison from Midhurst achieved three B grades in Biology, English Literature and History; to study Rural Land Management at the Royal Agricultural College. Victoria Markland from Jersey achieved three B grades in Classical Civilisation, Dance and Psychology; to read Psychology at Bath Spa. Jack Scullion from Petersfield achieved three B grades in Biology, Economics and Psychology; to study Sports Science with Management at Loughborough. Kim Viljoen from Shoreham-by-Sea, West Sussex achieved three B grades in Physics, Mathematics and Religious Studies; to study Mathematical, Statistical and Actuarial Sciences at Heriot-Watt University, Edinburgh.